Around the same time as my last post, local event guru Mark Kyriss sent out the word that hew as putting on a Monday night fantasy tournament in early July. Curious as to how we would fit a tournament into just one evening, I looked over the detailed rulespack for the event. He used the Regiment of Renown pack that Games Workshop recently put out, an excellent system that really brings small scale Warhammer to life. The games are only 100 points, and you buy individual models, not regiments. The idea is that you have formed up a grizzled group of veteran mercenaries (your own “Regiment of Renown”). Up to three models can choose from a list of free upgrades (e.g. “hand crafted ammo” allows you to ignore the penalty to hit for long range), and you promote one model to be your leader. Your leader gets +1 wound, can be upgraded to a champion, and can get up to 20 points in magic items for free. At the end of each game, you roll 2d6 and consult a chart and gain a bonus to your leader. I went down the Game Shoppe last Monday night, and they had a good turnout (16 players if I remember right). I went 5-1, losing my first game to fellow Outlander JT. Of the 8 shots my leader got off, he hit with none. It was that kind of game, and JT had Khorne warriors of chaos. The rest of the games, my leader went nuts. After two games I got the +WS or BS twice, so he was up to BS 6. Basically, I was pointing at models and deleting them a turn. Some beardy dudes brought chariots with, but he made quick work of them. I had a lot of fun. I had scrambled to try and get a mini display board ready in time, but just couldn’t finish it. Even though the event was done, I figured there would be more of them so I went ahead and finished it. 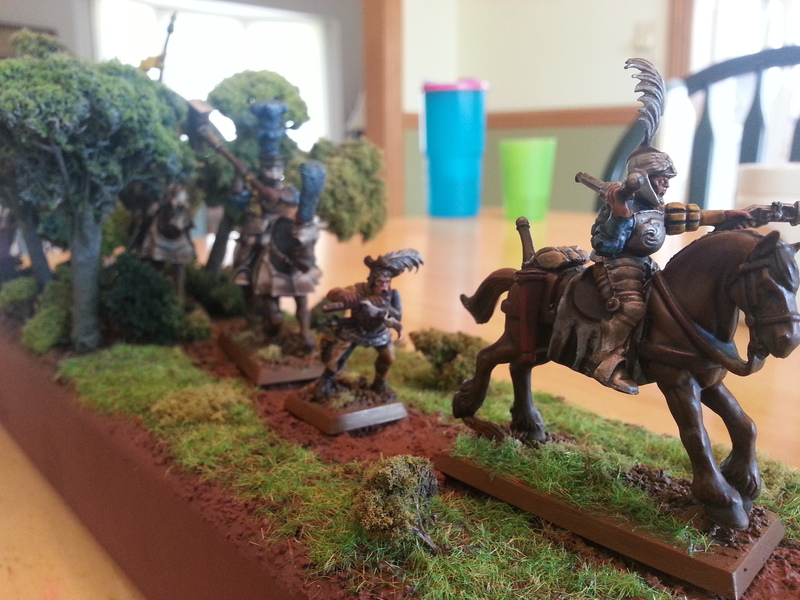 I had a spare 2×4 lying around, and I wanted a scene of the Regiment returning from another job to collect their payment. 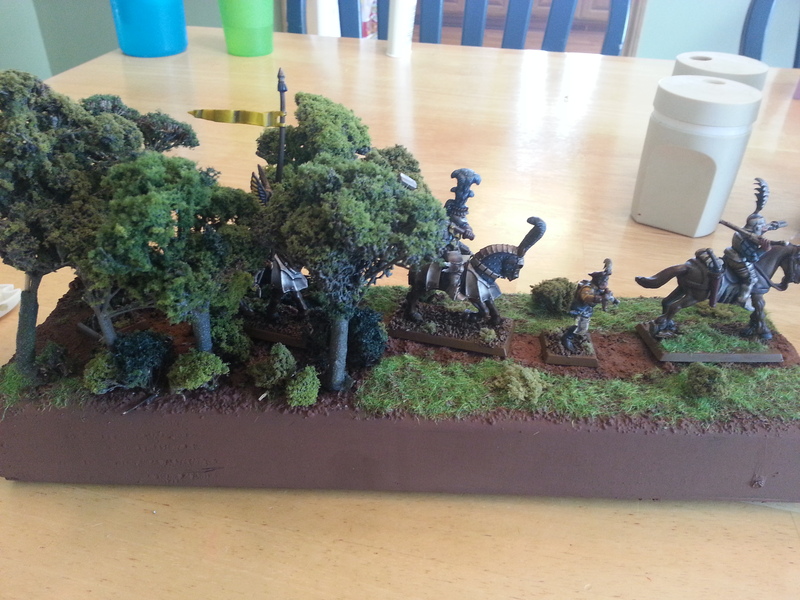 I had some model trees laying about, so I decided to model them leaving the depths of the forest after hunting beastmen or goblins or whatever and making it into the clearing and on the way home. I’ll go back after I get some major 40k progress done and stencil in some writing on the front of the board, but for now I’m happy. I know I got lucky getting two +BS rolls right at the start, so I’m going to drop one knight to regular and making him an Outrider champion. He’ll still have the repeater pistol, but have BS5. I *really* enjoyed playing Regiment of Renown. I think it’s a great way to let people play with armies that they maybe have an interest in, but don’t have the time/money/etc. to paint up a full army. The format is nice too because models that are usually subpar become really good, and vice versa (the fact that people were complaining about the cheesiness of a pistollier champ should be proof of that!). I think there’s a hobby element to this as well to really tap into because you can invest a lot of time in making your models have some awesome character. Here is a WIP shot, I won’t take a finished shot until I have the whole squad ready to go. This also gives me a good opportunity to test out making a display board in the style I want to do for the Adepticon team tournament. My plan is to do a hallway, maybe a T-intersection. My 40mm objective marker (required for the tournament) is an injured marine with a power sword broken off at the hilt slumped down and wounded. I have some ork nobz and other bitz that I’ll use to fill out the scene. I hope to have some pictures of the board later this week. That’s all for now. I’ll post some pics of my Imperial Fists, the stormraven lander, and update on my guard when I start my “countdown to the Khornehusker” series of posts as I have three months to get an 1850 point force ready. That’s all for now! 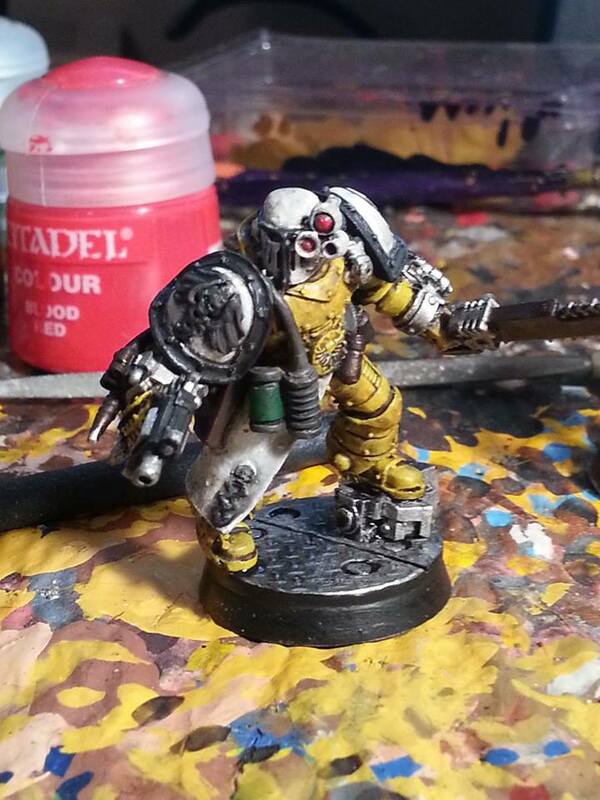 Posted in Frontpage, Omaha, Warhammer 40k and tagged 40k, adeptcion, empire, game shoppe, imperial fists, kill team, regiment of renown, team tournament, Warhammer, warhammer 40k.